1) Many people have seen huge increases in consumption after the installation of smeters, increases that cannot be explained by any changes such as a new hot tub (which is BC Hydro’s favorite suggestion). Below, in “Letters”, is a comment that was made to the article but it doesn’t show. She cc’d it to a US group. 2) A United Nations Working Group has developed and submitted recommendations for corporations to respect human rights while developing/implementing Sustainable Development Goals (SDGs). See “Letters” for highlights. It is arguable that BC Hydro, FortisBC, Telus, and various telecoms are following these principles. Our human right to live unassaulted in our homes is being infringed upon. 3) A patent application from 15 years ago for the Wi-Fi mesh for airplanes, so that no one will ever have to be without a wireless connection again, using other planes to relay the signals. Imagine the level of RF inside the Faraday cages with people flying in them all day, every day. Wonder if some of the bizarre behavior is due to this irradiation…. Notice on line 50, page 10/14 where they admit that fiber optic cable is the best on land and, although expensive to install, is cheap in the long run. With the fiber optic cable being installed by Telus throughout BC, why doesn’t BC Hydro use smeters that connect to the best means of transferring data instead of using the most vulnerable and least dependable? 4) In Illinois, AT&T is asking for legislation to allow eventual elimination of traditional landlines. This is all for the benefit of the telecoms, without consideration for their customers. I hope you will consider writing to John Horgan and your MLA about this before Telus begins its push. We need to keep the copper landlines which, I’ve been told, are already being replaced (without people being told) by Voice Over Internet and wireless. What would people with medical devices do for phone service? Many devices suffer interference from wireless radiation. “Julie Vahling, associate state director for AARP and the organization’s lead lobbyist in Springfield on this issue, worries that people who are poorer and on fixed incomes could be forced into a new system that may be more costly and not as reliable. She says many AARP members are upset that lawmakers voted for this change. 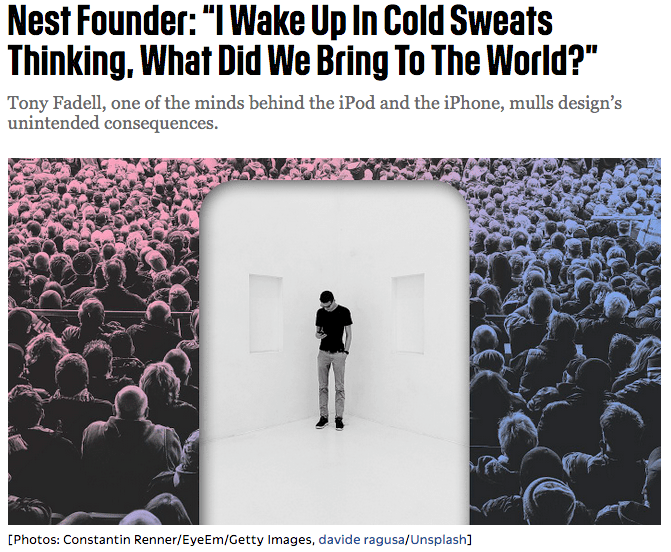 5) Some of those responsible for the technological world we live in are now having second thoughts…. Yes, because when a so-called “smart meter” was installed at my home in September 2012, my usage as calculated by the smart meter immediately doubled and tripled. Consequently, my electric bill doubled and tripled. There has been no change in the electric-powered appliances in my home. This increase in costs to consumers and income to Southern California Edison was not only reflected in my individual bills but by many users in Los Angeles and California. The internet was full of stories such as mine. I have copies of the comments. It may be that smart meters, using digital technology, capture electricity usage more efficiently than the old meters using analog technology, but they capture usage differently. 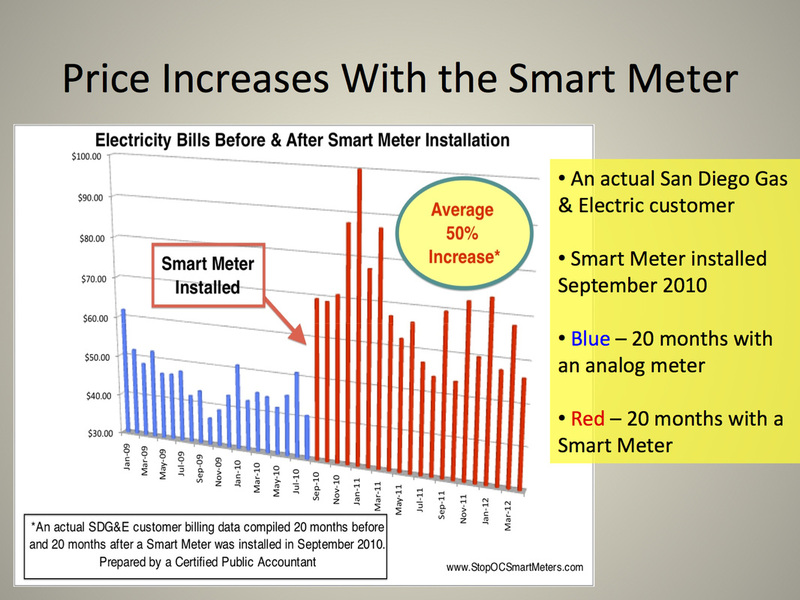 When I spoke to a gentleman at the Public Utilities Commission in July 2013, he confirmed that the basic rate structure was based on surveys of residential usage captured on analog meters — not on the increased usage captured by the new and improved smart meters. If the installation of smart meters has resulted in my bills tripling (and it has), then SCE has received a windfall increase in monthly income. Shouldn’t the rate structure be revisited (by SCE and PUC) and the SCE windfall increase in monthly income be considered in assigning a fair and just basic rate? Human rights are essential to achieving the Sustainable Development Goals (SDGs). Simply put, a development path in which human rights are not respected and protected cannot be sustainable, and would render the notion of sustainable development meaningless. Rightly, the 2030 Agenda for Sustainable Development is explicitly grounded in the UN Charter, the Universal Declaration of Human Rights, international human rights and labour rights treaties and other instruments, stating that the aim of the SDGs is to “realize the human rights of all”. The SDGs themselves and their targets also cover a wide range of issues that mirror international human rights and labour standards. Many of the SDGs relate closely to economic, social and cultural rights, including rights focused on health, education, food, shelter, alongside the rights of specific groups such as women, children and indigenous peoples. In addition, SDG 16 on the need for peaceful, just and inclusive societies emphasizes key civil and political rights, including personal security, access to justice, and fundamental freedoms. The 2030 Agenda emphasizes that the business sector is a key partner for the United Nations and governments in achieving the SDGs. Notably goal 17 speaks of revitalizing global partnerships for sustainable development, including public-private partnerships. Paragraph 67 of the 2030 Agenda calls on “all businesses to apply their creativity and innovation to solving sustainable development challenges” and commits States to “foster a dynamic and wellfunctioning business sector, while protecting labour rights and environmental and health standards in accordance with international standards and agreements and other ongoing related initiatives, such as the Guiding Principles on Business and Human Rights…”. States have a critical role to play in ensuring that SDG implementation efforts are consistent with the human rights framework on which the 2030 Agenda is based. The State duty to protect people from business-related human rights abuse includes the task of ensuring that businesses will contribute to, not undermine, inclusive and sustainable development. The foundation of the State duty to protect as set out in the Guiding Principles requires States to protect against human rights abuse within their territory and/or jurisdiction by third parties, including business enterprises. This requires taking appropriate steps to prevent, investigate, punish and redress such abuse through effective policies, legislation, regulations and adjudication. It also requires States to set out clearly the expectation that all business enterprises domiciled in their territory and/or jurisdiction respect human rights throughout their operations. This implies having in place laws that require and enable business respect for human rights, and providing guidance to business enterprises on how to identify, prevent, and mitigate adverse human rights impacts linked to their operations. 2. States must ensure that their business partners for sustainable development have made a clear and demonstrable commitment to the UN Guiding Principles on Business and Human Rights, and uphold these Principles in efforts to reach the SDGs. While partnerships with the business sector are a key part of the strategy for achieving the SDGs, States are responsible for setting national sustainable development policies and priorities to meet the SDG targets that they have committed to by 2030. As and when governments partner with business to achieve the SDGs, they must ensure that their partners have taken demonstrable steps to embed respect human rights across their operations. When seeking to engage business in pursuit of SDGs, States must at the same time emphasize that human rights – not profits – come first. Related to this, as States are beginning to encourage business to report on their contributions to the SDGs, they should also ensure that reporting frameworks are aligned with the Guiding Principles so that businesses disclose impacts to people across their activities and how negative impacts are being addressed. 6. For business, the most powerful contribution to sustainable development is to embed respect for human rights across their value chains. And business respect for human rights is not a choice, it is a responsibility. The role of business in implementing the SDGs is different from, and goes beyond, traditional corporate social responsibility. Philanthropy or social enterprise are to be welcomed, but cannot substitute for meeting the responsibility to respect human rights, which all businesses regardless of size, sector or location, are expected to meet. Respecting human rights means avoiding adverse impacts on the human rights of others and addressing the adverse impacts with which the business is involved. Business implementation of the Guiding Principles is not simply about ensuring “do no harm”, or just a starting point towards making a positive contribution to sustainable development. Implementing the Guiding Principles in itself has tremendous potential to contribute towards positive change for the hundreds of millions of the poorest and most marginalized people across the world, for whom the term “sustainable development” would otherwise ring hollow.